This was the place that gave me the idea for Kids Who Brunch. We had the boys out, chomping on fried chicken, and a woman remarked: “That is so cool that you guys bring them here.” I say that to say, I went into this one knowing I already liked it and I already had some helpful hints from last time. If you’re not familiar, Welcome Chicken + Donuts is the brainchild of the same folks behind Welcome Diner (a place I’ve still yet to try). Since then, we’ve been a few times and have learned a few things. The first thing I learned was that buying my kids a one-piece was an exercise in futility. If your kids are big eaters like mine (and they are only 3 and 6! ), do what I did and spring for the whole chicken. Seems pricey, but it’s cheaper than ordering them separate meals. I also requested the yummy sauce on the side – it was too spicy for the kids, but the hubby and I dipped into it while we were, um, making sure the kids’ chicken was not too hot. Side note: This is the crispiest, most delicious non-Southern fried chicken I’ve had in … maybe forever. It’s based on KFC – Korean Fried Chicken – and it’s the best thing that will happen to you on a Sunday. 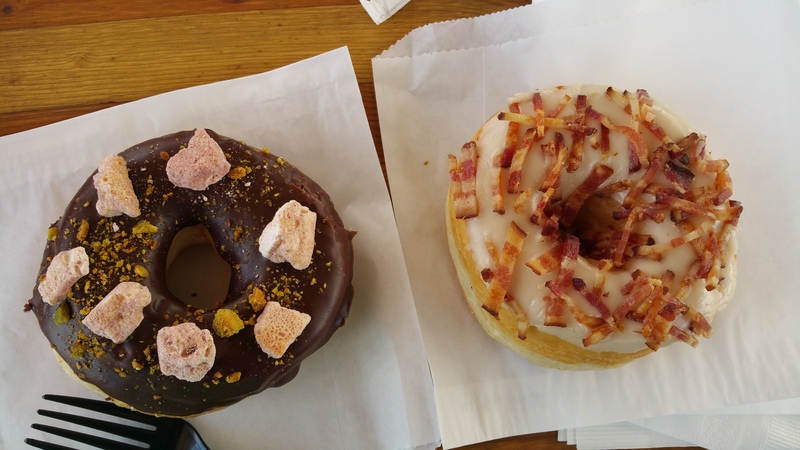 Rose pistachio chocolate and maple bacon. 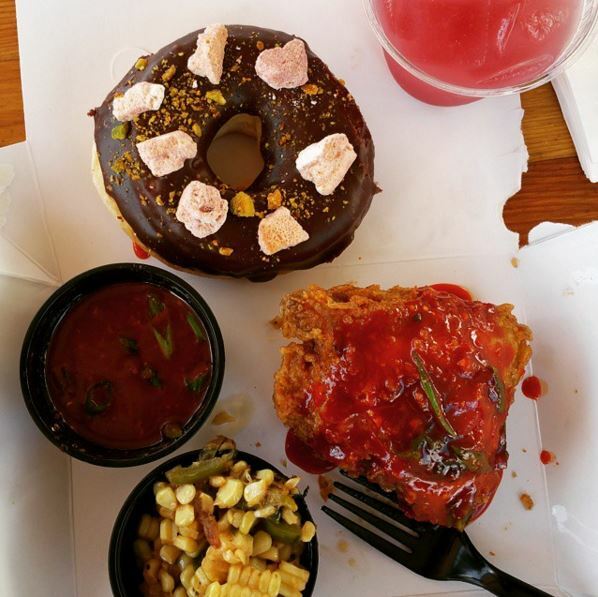 Each chicken meal comes with a plain cake doughnut. The little guy likes the flavor and texture, while the big guy only goes for glazed. For a little extra, you can upgrade to one of the doughnuts in the case. The oooonllly reason to NOT order chicken is if they’re serving Ramen. The Ramen takes a bit of time – be prepared to see folks who ordered chicken get theirs before you get your Ramen. But that’s why you have kids! Order an extra doughnut or two and skim a few pieces of chicken from the kiddos. The Ramen is worth the wait. They don’t serve Ramen every Sunday, so follow all their social media handles for when they WILL be serving and to find out what specialty doughnuts they have in the case. When you get there, the atmosphere will be HIGH, the place will be PACKED and you want to have an idea of what you want before you get to the counter. They also offer beer and cocktails to make it a TRUE brunch. Note: They start serving chicken at 10 a.m. so you want to get there a little bit before that. The place will be packed!! 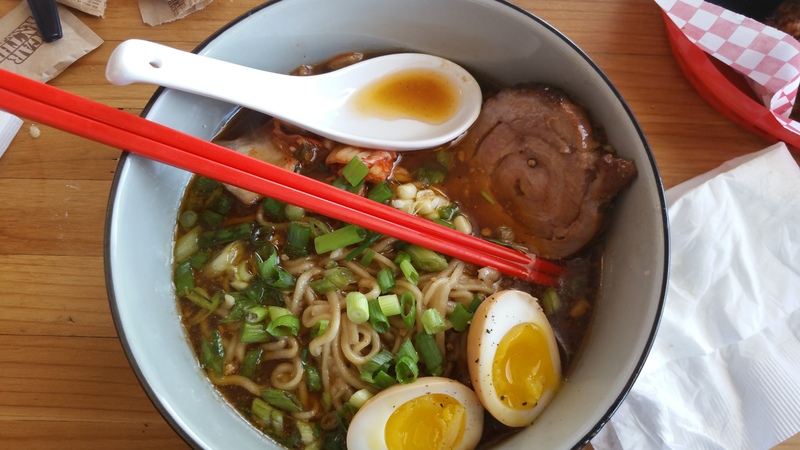 Pork belly ramen. They also serve a vegan version. Kid-friendliness: No kids’ menu, but you can get either meals or chicken only to accommodate how your kids eat. They also have breakfast sandwiches, but check their social media sites to see what offerings they have for the weekend. They have milk for the kiddos – but skip it; no need to pay $3 if your kids won’t drink it all. Bring the kids’ water bottles instead. The outdoor space is perfect for kids, and you won’t feel bad if they spill something or get too loud. I’m on a mission to brunch my way through Phoenix – kids in tow. Kids who Brunch is basically like a brunch review for parents.